Blogging is the most powerful way to share your knowledge with the world, that's why people will come to your blog to get information, what they want. 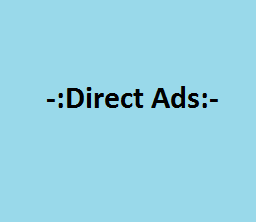 In this article I will discuss with you about direct advertisement, exactly what is direct advertisements. Here is the answer for you, advertiser directly contact you to show advertisement on your blog, now question may be going on your mind, how do you get direct advertisement for your blog, answer is you can make a page for "Advertise With Us". It is quiet easy way to get direct advertisement for your blog, I have figured out some points whose are important to get direct advertisements. To get direct advertisement create a page like "Advertising With Us", write about your blog, means what you are providing for people. One more thing you must mention your Alexa rank also. There are many things to add on Advertisement page, but you need to add things about your blog at a glance, I mean don't not put anything which will not impress those are interested in your Advertise with Us program, always remember each and every body is your customer those are reading Advertise with Us page, you can even easily see how people are spending time on the page, okay it is simple to see what people are doing on your blog and more interesting thing is that, it is free. If you are little aware about it, then you are understanding what is it. This is really going to work for you, show sample advertisement on your blog then do write on the banner "Advertise Here". As I have seen there are about 99% websites, blogs attract advertisers through banners, well it is one of the most effective way to get ads on your blog, but try to make it genuine and professional also, take your time for designing the banner or else take a look few blogs those used such type of banner. Quick contacts are important to get in contact with advertiser like put phone number, email address. I think these two are good for getting in contact with the advertiser quickly. See, if any one interested for ads on your blog or website then I am sure for adding quick contact link will be increase the chances of getting more ads on your blog. In any business you have to give offer to your customers to get attracted like offering coupon code, limited time discount offer. But don't repeat the same offer every time, every time change offer for keep attracting your customers to your blog. This is sure, if you can attract direct advertisers then you will make lot of money than from advertisement network, because advertisement networks earn money from you, they paid you 50 to 70% of the advertiser paying. Now, think about this, if any how, means if you will follow my tips and tricks then you can easily then direct advertiser and make sure once you find someone to advertise on your blog then don't forget to ask for writing testimonials as well as about your blog traffic quality, it will encourage others to advertisement on your blog. I hope these tips and tricks will help you lot for getting direct advertisers.